Can ya believe it — a new comic shop in Eatontown, NJ, in this day and age? Me ‘n’ a buddy visited The Comic Crypt, which opened a few months back at 73 Route 35 in town. Any comic book aficionado or genre freak will feel right at home in this spot. We were just looky-looing; I found a Charlton reprint of a Steve Ditko horror story in one of the dollar boxes. On the plus side, this was clearly not a reproduction. Though the poster was weathered with some crude repairs, there was no disputing that this was the genuine article. Above is what the poster would have looked like before trimming. The green edges were gone. Out of curiosity, I asked Brian the price. He said he’d take 10 bucks for it. Ten bucks? Wow. 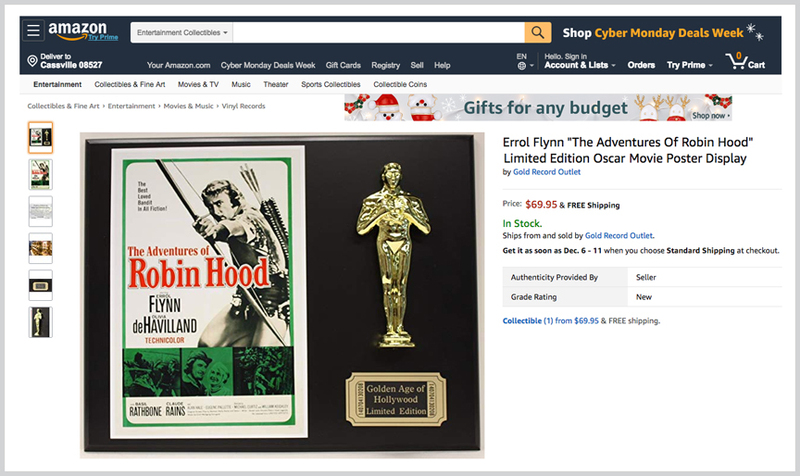 But even though I love, love, love “The Adventures of Robin Hood,” I didn’t even consider buying it, for several reasons. One is that I’m on a careful budget at the moment. (For the second time in 10 years, I lost my newspaperin’ job to a downsizing.) The other is that lately, I’m feeling like I’m at that stage in life where I shouldn’t be collecting anymore. Stuff should be leaving my home, not coming in. 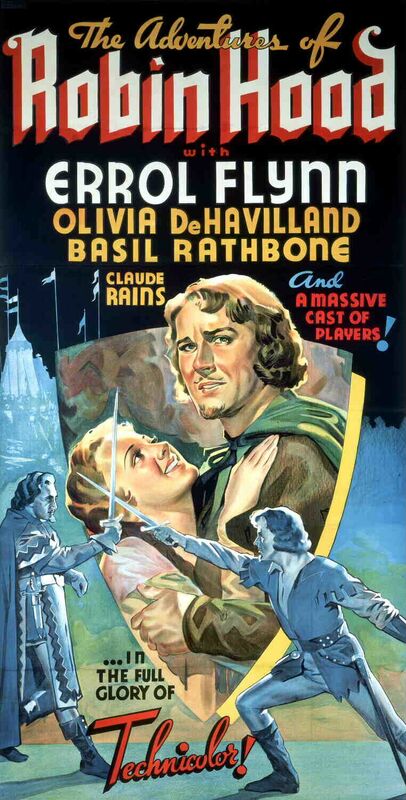 Still, Michael Curtiz and William Keighley‘s “The Adventures of Robin Hood” is a movie miracle. People call it a “swashbuckler” or an “action thriller,” which it certainly is. But I think of it as a children’s film, like “The Wizard of Oz.” The characters are written, cast and played almost like cartoons (in a good way). The costumes and sets are as sumptuously, ridiculously colorful. Music punctuates every line of dialogue and movement. Whatever age you are when you watch it, you feel like you’re 8 years old. However, I stood firm that I would not buy this poster. Not even for the bargain price of 10 lousy bucks. The answer was, emphatically, no. Here it is, hanging in my home the following day. Brian and my buddy helped me come to my senses. 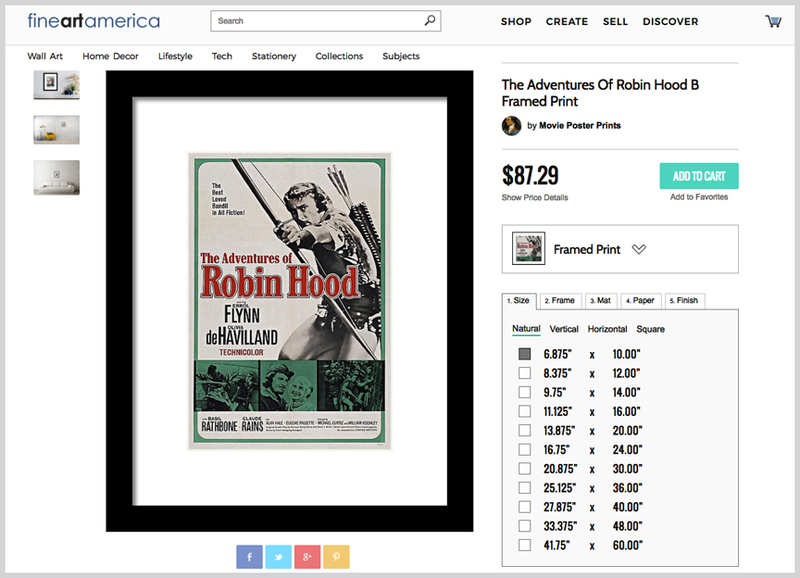 Brian mentioned that the frame itself would cost more than 10 bucks at Michael’s. My buddy said, “Life is short” — always a handy catch-all when you’re on the fence. I looked at my Charlton reprint and thought, “How can I spend a buck on this yellowed old comic book — a reprint, yet — when I could have a ‘Robin Hood’ poster for nine more?” So, with a mixture of excitement and guilt, I plopped down a twenty and got back a ten. What is the poster worth? In its trimmed form, it can’t be much. Compromised though my poster is, I still love it. I get “the feeling” when I gaze upon it. But an uncompromised version of the poster would command some considerable scratch. Above is one for $285. Hey, ya know how you’ll google around and find a website that seems like it’s from, like, the dawn of the internet? 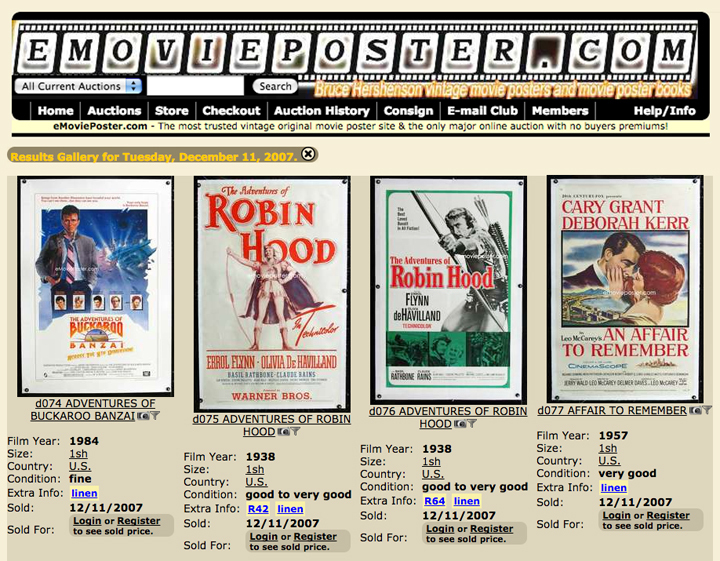 The poster was sold on another auction site that apparently hasn’t be active since 2007. But the site’s typography, design and navigation make it seem like it’s from the ’90s. Times change quickly. I also found reproductions. Above is one from FineArtAmerica (a site I currently cannot get onto). Reproductions were offered, matted and framed, in various sizes and prices. Another friend of mine swears by reproductions. 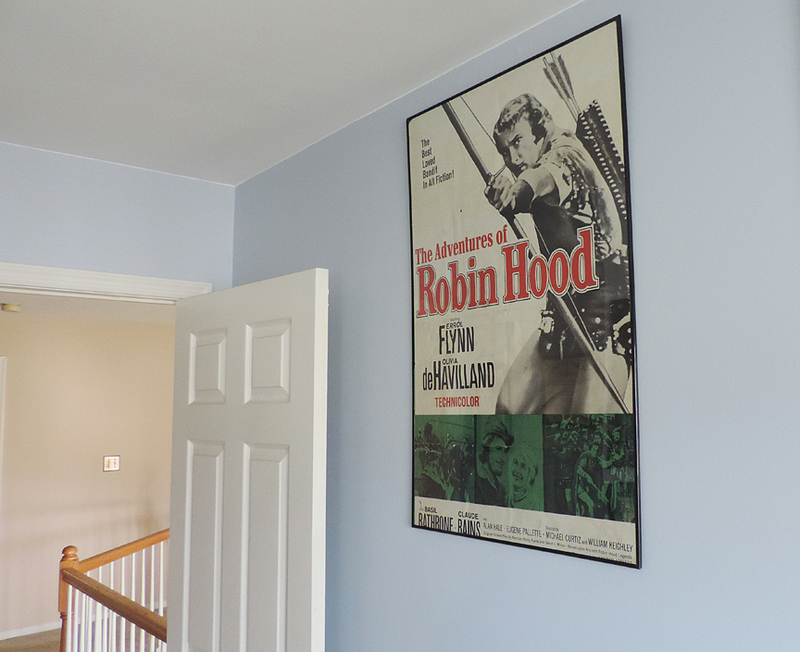 He decorated his living room with large, framed-and-matted reproductions of classic film posters. But I didn’t have much luck the time I ordered one. I don’t remember which company it was, but I bought a mid-sized print of the “Coffy” poster showing Pam Grier in a righteous Afro. When it arrived, it looked like it was printed off of a low-res jpg. The company refunded my money and told me to keep or discard the offending print. I stuck it in my garage, unceremoniously affixed to the wall by thumbtacks. 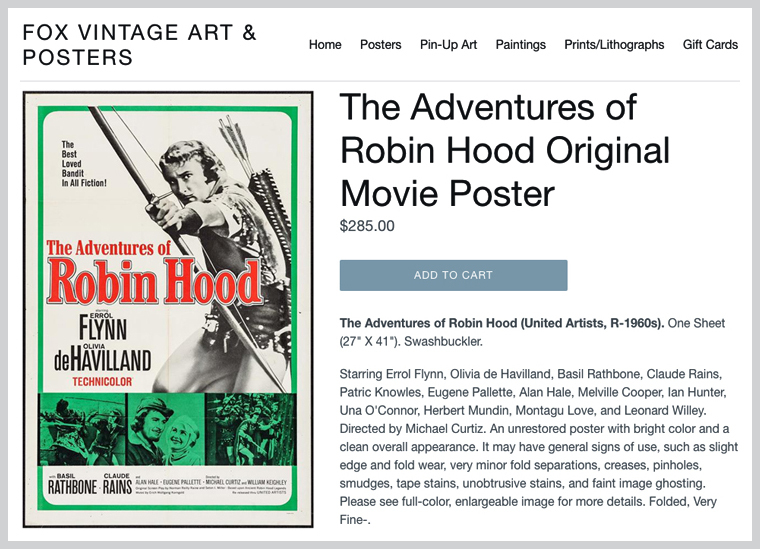 FineArt had also offered reproductions of my poster on merch such as T-shirts, coffee mugs, etc. I couldn’t wear the above T-shirt — white doesn’t look good on tubby guys — but their coffee mug sure looked sweet. Above is the weirdest thing I found: A reproduction mounted with a faux “Oscar” statue. The Oscar is a heavily copyrighted, heavily enforced property. (All those years I did Oscar pages for The Star-Ledger and The Asbury Park Press, photos of the Oscar statue would be watermarked “AMPAS.” Also, when you search Shutterstock or iStock for Oscar photos, you find everything but solo money shots of the statue itself.) The above “Limited Edition Oscar Movie Poster Display” has a rather gnarled Oscar-esque punch-out with a bit of a nose. Different enough to avoid reprisal? I dunno — the manufacturer still uses the word “Oscar” in its product name. Tread lightly, dudes. 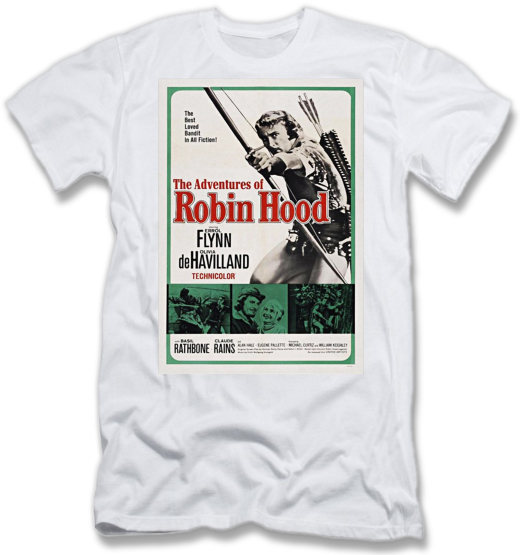 Above is what a “Robin Hood” poster from 1938 looks like. We knew our comic-shop find couldn’t have been from the Golden Age of Hollywood, but it’s a cool little curio just the same. I love it. And one day, perhaps the twinge of guilt I feel when I view it will go away. 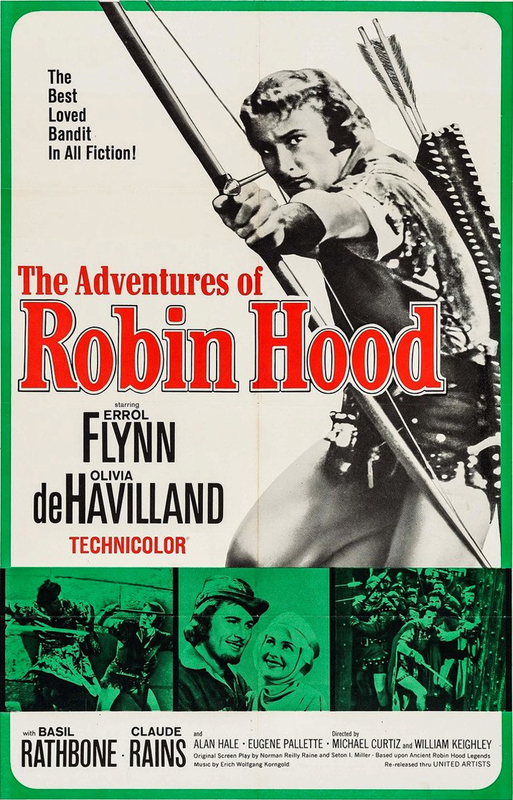 VIDEO: Below is a trailer for “The Adventures of Robin Hood.” The climactic swordfight between Errol Flynn and Basil Rathbone is pure movie magic. Do you hear me? Pure movie magic!